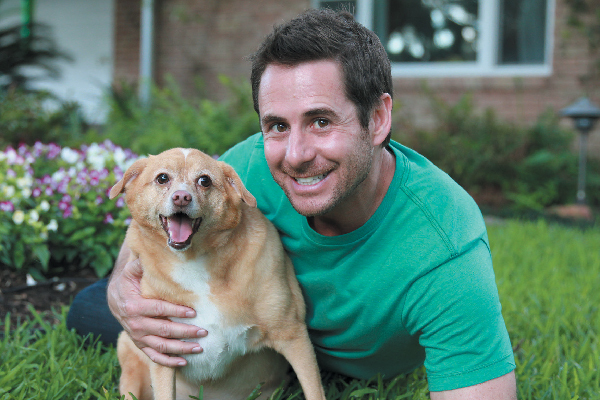 As the host of Animal Planet’s My Big Fat Pet Makeover, dog trainer Travis Brorsen is on a mission to end the pet obesity epidemic. In each episode he steps in to help people change the lives of their obese pets by teaching the humans of the household how to optimize a pet’s diet, training and exercise regime. My Big Fat Pet Makeover is not a show about shaming pet owners but about educating and empowering them, because if anyone can identify with becoming a better pet parent thanks to reality TV, it’s Travis himself. Travis Brorsen of My Big Fat Pet Makeover. Photography courtesy Animal Planet. These days, he’s a renowned New York City dog trainer, but in 2008, Travis was a Los Angeles actor who suddenly found himself with a lot of extra time on his hands thanks to a historic writer’s strike that halted scripted TV production. “So I was like, well, gosh, I guess I just need a dog,” Travis recalls. The Oklahoma native was in luck, as his sister’s rescue dog had just had puppies. He brought a Boxer pup named Presley back to California, but training his new buddy proved to be a challenge. Despite growing up on a ranch, Travis made some mistakes that are common among first-time pet parents. “He knew his name well enough to know he was in trouble, because that’s one of the biggest mistakes we all make, associating our dog’s name with ‘Get out of there’ or ‘Stop doing that,’” Travis recalls. One day the two were hiking in Runyon Canyon, an off-leash spot, when Presley took off running. A woman (who turned out to be a reality TV show recruiter) approached Travis. “She said, ‘Is that your dog?’ and my first thought was, ‘Well, that’s kind of a loaded question. Did he do something wrong? I don’t know if I want to claim him or not.’ She said ‘No, no, he’s great,’” Travis says. The show saw Travis and young Presley competing against other human-dog duos in a series of training challenges, and it changed their relationship and their lives. He and Presley both proved to be quick students, and they ended up winning the series. The key to their success was the education in training that he got during the course of the show, and that’s what he’s trying to pass on through My Big Fat Pet Makeover. 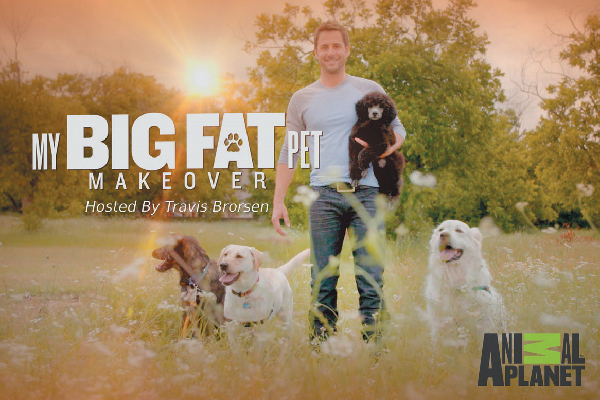 The first season of My Big Fat Pet Makeover is available to stream on the Animal Planet Go app. Photography courtesy Animal Planet. On each episode of the series Travis intervenes in the lives of obese pets whose people have shown their love with maybe a few too many treats, teaching them about how diet, exercise and positive training can change a dog’s behavior, body and their bond with their humans. It’s not about making fun of the obese animals, Travis says, but about giving people the knowledge they need. “Let’s build people up through education to empower them to make the right choices with their pets,” he tells Dogster. Now the founder and CEO of Greatest American Trainers, Travis is committed to changing lives both on and off the screen. Whether we’re talking about a pampered city pooch whose doorman is doling out treats or a Midwestern mixed breed with a human who overfills the bowl, Travis says the best weapon in fighting pet obesity across America is education. That’s one thing this reality TV veteran dishes out plenty of, alongside a big helping of entertainment. Thumbnail: Photography courtesy Animal Planet. Heather Marcoux is a freelance writer whose pets (thankfully) do not need makeovers. She’s never been on a reality show but is a former TV morning show host. These days she sleeps in with her dogs, GhostBuster and Marshmallow, who go by @ghostpets on Instagram. The post Changing Lives With ‘My Big Fat Pet Makeover’ Host Travis Brorsen appeared first on Dogster.